Secret recordings have emerged apparently connecting a Labour council to an alleged £2m corruption scandal. The allegations, reportedly made in tapes leaked to the Sunday Times, are of a businessman linked to a Labour-led London authority offering to deliver planning permission for a development in exchange for the "premium". Tower Hamlets Council said it referred the case to the National Crime Agency. The Labour Party said it was "committed to fighting corruption". 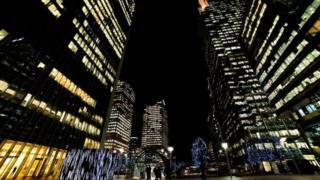 The allegations are said to relate to two proposed skyscrapers with more than 600 homes on Alpha Square, Canary Wharf. The development was approved by former London mayor Boris Johnson on appeal in April 2016 but "never took place", the council said. Labour said it would not comment on the case but stated that "corruption steals from the many to line the pockets of the few". Former council leader Lutfur Rahman was removed from office in 2015 after he was found guilty of electoral fraud. The authority is now led by Labour mayor John Biggs, who said: "Since I was elected I have worked tirelessly to combat corruption and wrongdoing and to make the council more open and transparent. "When these allegations were raised with me I immediately made the chief executive and the council's monitoring officer aware and passed over the material I was given for them to act upon. "The council commissioned an external investigation to look into the allegations and gather evidence which was subsequently referred to the Serious Fraud Office." A council spokesman added that "sound governance and transparency has been at the heart of Tower Hamlets Council's work since the change of leadership in 2015". He added: "This has included a new whistle-blowing policy, clear processes for decision-making and the independent investigation of historic complaints of wrongdoing. "Our planning process was not compromised in any way by the Alpha Square planning application." The NCA said it "considers carefully allegations of serious bribery and corruption offences".